Time to sell your Sand Dollar condo? Read about today's resort-market condo buyer. Sand Dollar condos are located in the heart of Gulf Shores just east of the "T" at the Gulf Shores Hangout and public beaches. Sand Dollar is within walking distance from numerous restaurants, entertainment, and shopping venues. The complex was built in 1981 and consists of 31 individual condos. The floor plans in Sand Dollar are two-bedroom condos at 900 square feet and the amenities include an outdoor pool and BBQ area. Please let us know if you would like further info for Sand Dollar or any other condos, homes, or real estate along the Gulf Coast or would like to schedule a private viewing by emailing info@condoinvestment.com or by calling (251) Area-Pro (251-273-2776) for immediate assistance. Check out these RENTAL TIPS to boost your Sand Dollar rental revenue. 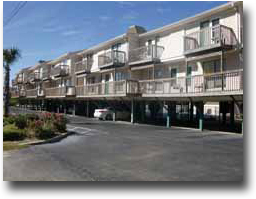 View annual rental incomes for Sand Dollar and all other Gulf Shores condos.